In this series of posts, we are going to analyze sales email campaigns written by some of the world's best SaaS companies. The entire collection of email campaigns can be found here: goodsalesemails.com. 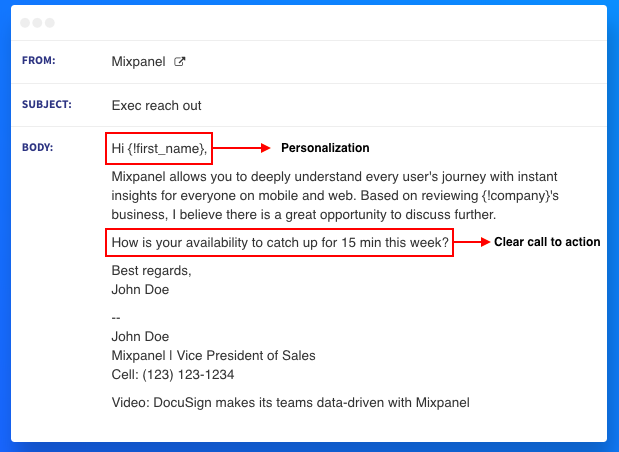 In this first post, we are going to analyze one of Mixpanel’s sales email campaigns. We will discuss the pros and the cons of each email, what we think is well done and suggestions on how it could be improved. The email is short. People have short attention spans when it comes to emails. Short and concise emails, like this one, have higher reply rates. The email uses personalization. Your sales emails should make your prospects feel special. This email uses personal information like the prospect’s first name, the name of the company and other relevant information about the company. The email has a clear call to action. Adding a clear call-to-action at the end of emails has a huge impact on the reply rates. In this case, the intent is clear: “a 15-minute meeting this week”. The email has a value proposition. The value proposition in this email is short, concise and straight to the point. This makes the email easy to read, and raises the curiosity of the prospect. The signature. This email has a detailed signature. In order to sound human and more trustworthy, you should add a detailed signature with job title, phone number, photo and other social media links. Introduce yourself. A short sentence, saying who you are, where you work and why you are reaching out will help you gain credibility, and can have an impact on your reply rates. This email does not have an introduction but the signature is self-explanatory. This type of shorter emails works best for very senior positions like VPs or C-level roles. Subject line. This subject line might not stand out in a cluttered inbox. A/B testing by adding personal information like first name, company name or even job title could improve the open rate. Cite relevant clients. Adding examples of relevant clients will help you gain your prospect's trust. The fact that big companies trust you to do business, will help raise their curiosity and increase your reply rates. Follow-up. A sales email in a busy inbox can easily slip through the cracks. That’s why the follow-up process is so important. Use every touch point to add value with additional relevant information like case studies, testimonials, etc. Hope this helps you get some ideas on how to write a good sales emails. Stay tuned for the next analysis of an email campaign from another company! If you have ideas or suggestions feel free to email us at team@amplemarket.com.